I bought mine directly from the Zoeva website in Germany but you can buy Zoeva from Beauty Bay and Love Makeup. They're made so well, they wash brilliantly, I have never had a hair shed and they blend eyeshadow beautifully. The non eye brush first, the 122 Petit Stippling. This is a soft, duo fibre brush made of taklon hair. It's relatively dense and I love using this for blending in my cream blush. It doesn't absorb too much product and buffs out hard lines seamlessly. It can also be used to apply powder or cream highlight and concealer. It retails for EUR12.80. The 225 Luxe Eye Blender is shorter and denser and has a rounded tip. Again it's perfect for placing colour in the crease and blending out. I personally do prefer the Luxe Petit Crease because it's just that little bit longer and more flexible and I prefer to use this for blending lighter colours-the Luxe Petit Crease is just again a little more precise with darker shades. It retails for EUR9.50. 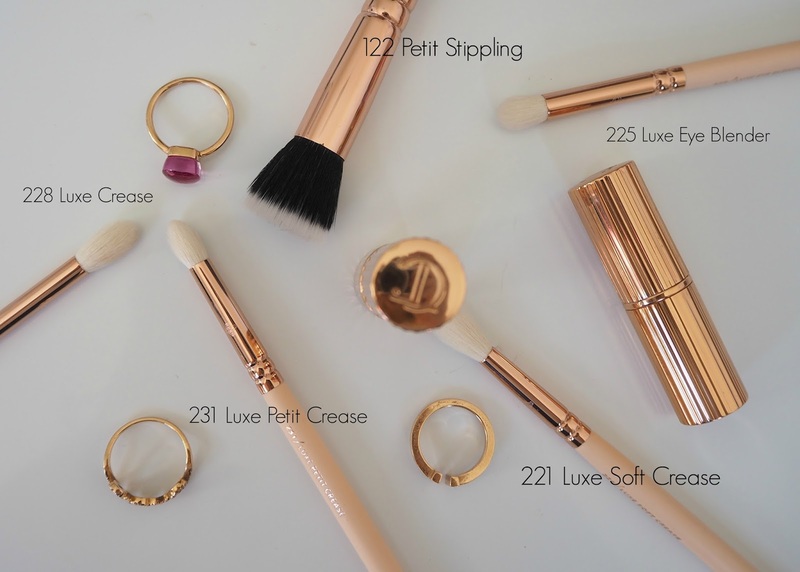 I would love your Zoeva recommendations for non eye related brushes-I am sure I would be impressed with the wider line that Zoeva offers given how much I love the ones I already own.